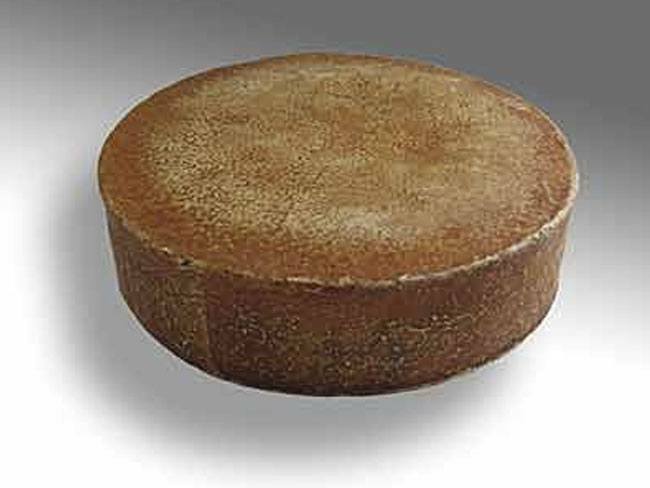 This is the classic 'mountain cheese' of France and Switzerland differentiated from the larger Ementhaller cheese by the much smaller or nonexistent holes. Gruyere, made from full fat raw milk, depends on a high temperature scald to dry the curd properly so the cheese is able to have a long aging period of 8-14 months. I usually begin this cheese with either 8 or 16 gallons of milk. 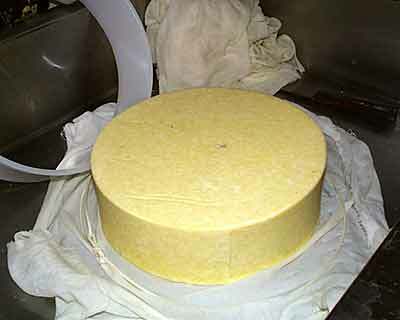 The larger size making for a longer aging cheese. The recipe below is for 8 gallons of milk. You will also add the 1/32 tsp Proprionic Shermanii at this time. Let your milk ripen for 1 hour. Next add 1 tsp. (4.5ml) single strength liquid rennet, stir in gently and let sit quietly for 30 minutes to coagulate. As the coagulation takes place you can check for a good set by using one of the methods shown above. A. 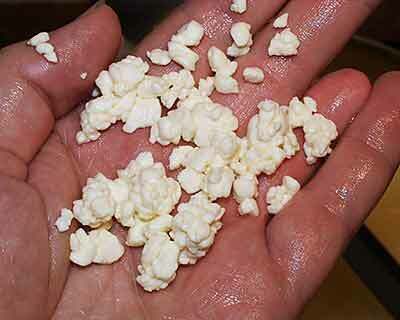 Pull the curd back from the edge of the vat with the back of your hand. B. Press down on the curd to feel for a proper firmness. 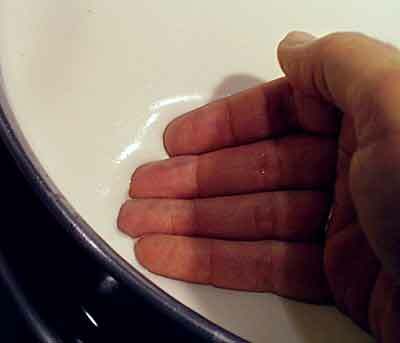 C. Use the traditional "splitting of the curd with a finger method." Before cutting the curd the cooler top layer should be turned over to warm for a few minutes. 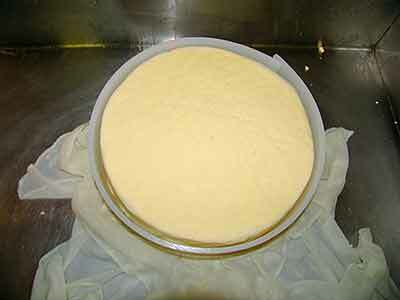 The curd will be quite soft so first cut to 1 inch than let rest for minutes. 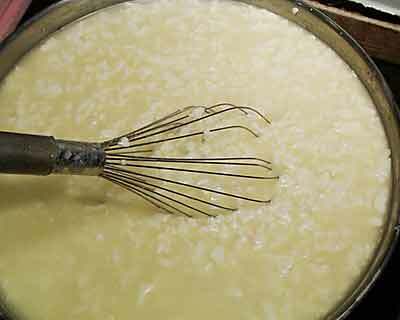 Next cut the curd to 1/4 inch and follow with a long stir to expel whey before the scalding. After being cut, the curd is scalded to 114°F over the next 30 min. 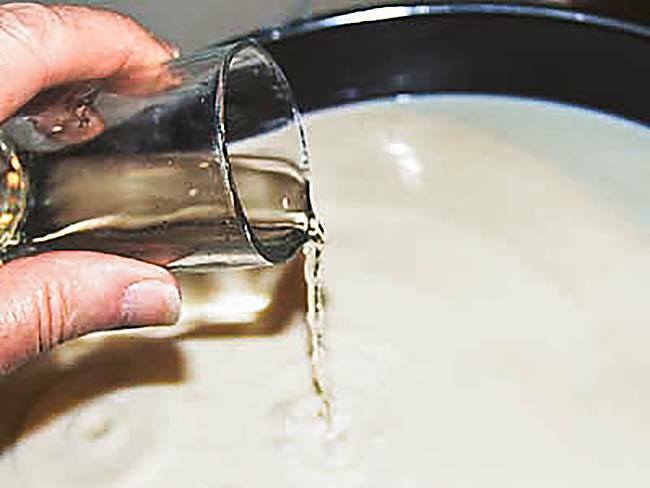 Once the curd reaches it's scald temperature the stirring continues until proper dryness is reached. More moisture for a younger, earlier ripening cheese and drier for a longer cave ageing. 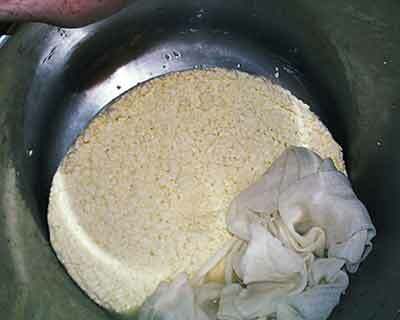 Now the whey should be drained down to the curd level. 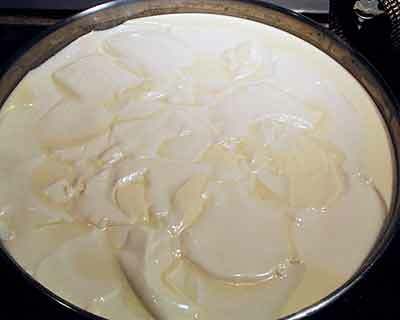 Once drained a weighted plate can be placed onto of the curds for pre-pressing which will consolidate the curd into a compact mass. For pre-pressing add 8-12 lbs of weight ontop of the plate. 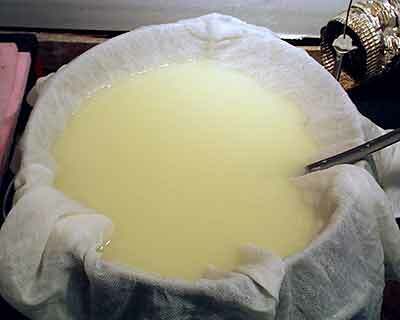 Following the pre-press, the consolidated curd mass can now be gathered in a cloth and transferred to the waiting form. Up until this point, very little acidity has been produced by the cultures due to the high temps so far. For this cheese use 25 lbs of weight and work up to a final weight of 50-100 lbs depending on how long you plan to age the cheese. 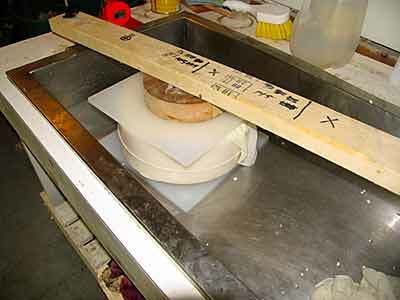 Less weight will yield a higher final moisture and hence young to medium aging cheese. The total pressing time will be 18-24 hours. 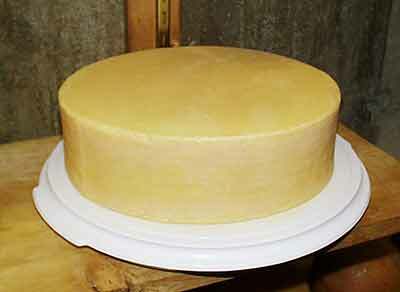 The goal is to end up with a cheese that is quite dry yet elastic to undergo many months of aging. 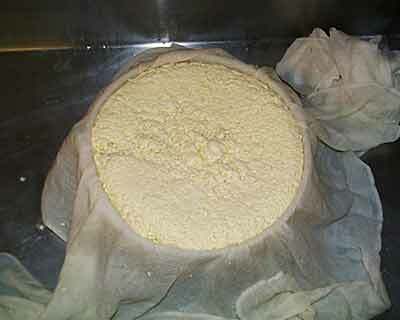 Your cheese can now be removed from the mold and placed into a brine solution for 24 hours. Be sure to sprinkle the top of your cheese with some cheese salt, flip it half way through and sprinkle salt over the top once more. 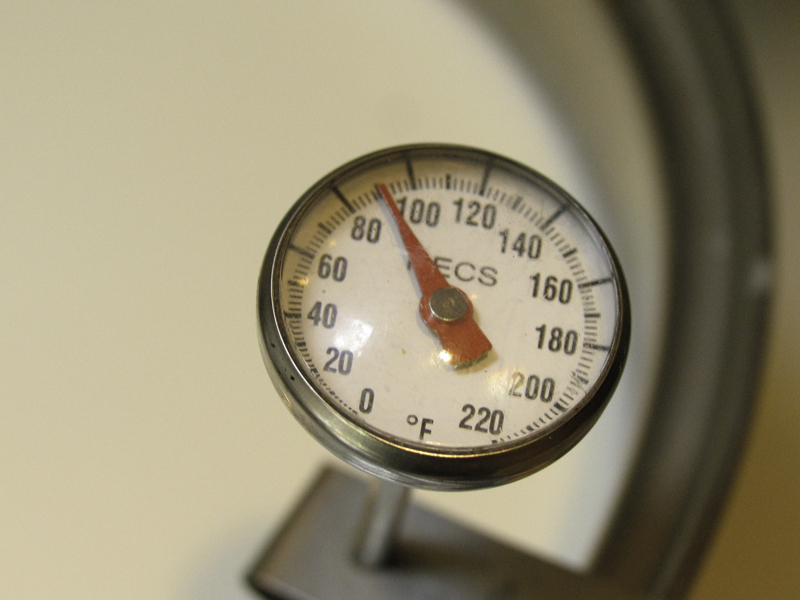 Once your cheese has been brined place it into a cheese cave at 54°F and 85% RH. For the next 2-3 days apply a rubbing with dry salt to the surface of your cheese. The cheese is now ready to be aged for 30-40 days. The aging temperature is 54-58°F and humidity of 85-87% should be maintained. Any surface mold should be wiped away with a saturated brine solution. Once the rind forms the cheese should be kept quite moist and washed with a light brine solution 2-3 times a week for 8-14 months. 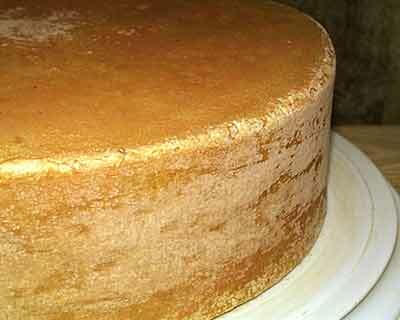 This will help to develop the proper ripening surface. 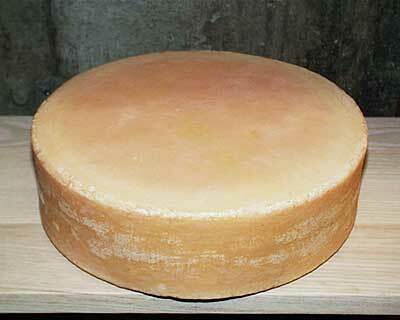 After a few months you will start to notice a traditional damp rosy rind forming. Finally, at 8-14 months the cheese will be ready. Note the smaller holes resulting from a cool cave temperature. 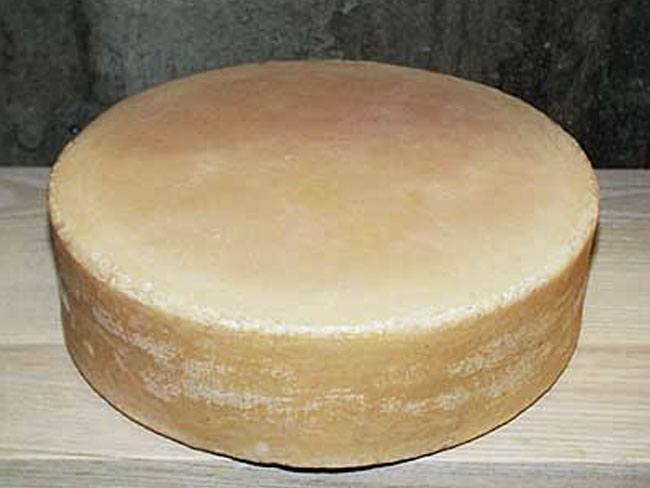 This is the classic 'mountain cheese' of France and Switzerland differentiated from the larger Ementhaller cheese by the much smaller or nonexistent holes. This cheese, made from full fat raw milk, depends on a high temp scald to dry the curd for a long aging period of 8-14 months. 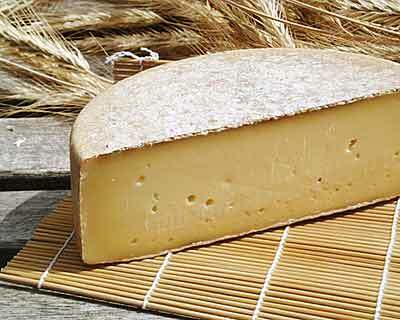 Gruyere has it's origin in the Alps of Switzerland and France. It was traditionally made to such a large size for ease of transporting down from the Alpage (high mountain pastures). 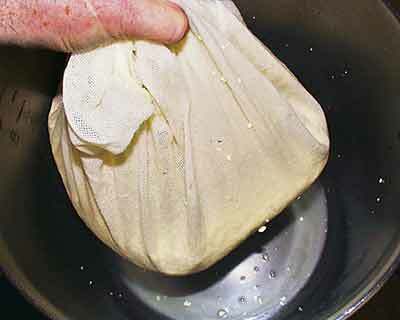 This cheese depends on very high cooking temperatures to allow it to age well over many months and hence dependent on a starter culture that does well at this high temperature. 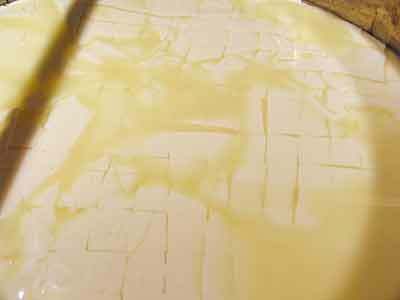 The methods for making this large cheese came from our visit to the Savoie region of France. gruyere recipe is a favorite!! I tried this recipe when i first started to make cheese, i believe it was the 3rd cheese i made using your recipe . Today its over 2 years and even though i tried different recipes but still my favorite recipe straight forward, clear, easy to follow and I always get a good product at the end. I'm new to "advanced" hard cheeses, having only made Jarlsberg once before (and it's still aging). Made Gruyere last week with raw goat milk. Used only 7.5 gallons instead of 8 because that was all my largest pot would hold. I ended up with a great looking cheese with a wonderful aroma that seemed to meet all the descriptions in the recipe. Just started the aging period and can hardly wait to try it. See you in 8 months! Making this today. Noticed an error in the name of the culture. Ingredient list says ta61, text says ta60. Don't think there is a ta60 so I'm using ta61. Looking forward to it!